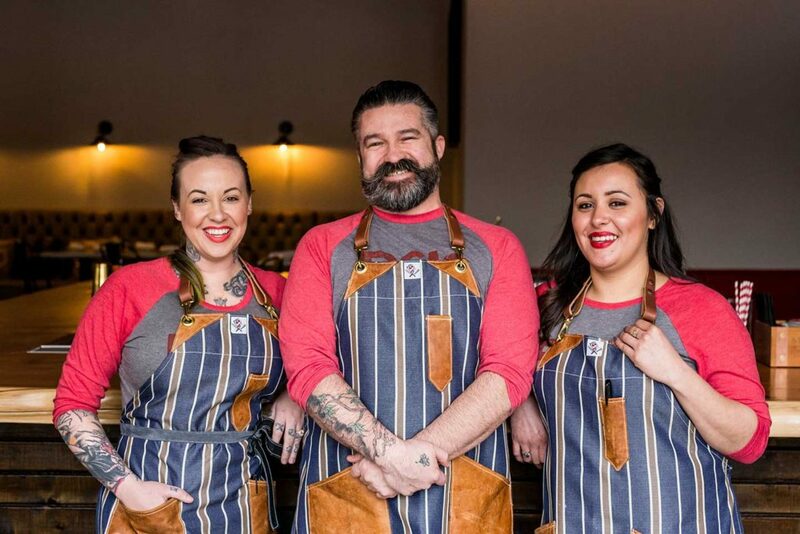 Nearly one year after opening their first Houston location, the owners behind Bosscat Kitchen + Libations are ready to debut their newest concept. Located in the former Glass Wall Restaurant location in the Heights, BCK: Kitchen & Cocktail Adventures will host a soft opening starting Feb. 7 with a limited rotating menu, according to a press release. Two weeks later, the “nostalgic American fare” eatery will officially open. With the help of Joshua Weisman of Houston-based Construction Concepts, the 3,000-square-foot space at 933 Studewood St. underwent a complete redesign and remodel, per the release. Renovations included “exclusive custom design elements, from hand-stitched luggage shelving to bench seating wrapped in steel,” per the release. Margaret Kiesel of Houston’s House of Fine Interiors supplied custom booths, and most of the interior décor was found at Houston Heights’ AG Antiques. Other design features include framed childhood photos of the owners: John Reed, Michael Reed, Leslie Nguyen, Vinnie Capizzi, Bosscat executive chef Peter Petro, Bosscat general manager Tai Nguyen and Bosscat bar director Matt Sharp, per the release. BCK will have seating for 108, and that includes 16 seats at the bar, per the release. All employees — 22 so far, a spokesman said — of the new concept will be outfitted with red Vans, a skateboarding shoe that Matt Sharp has been wearing since his middle school days. “We’ve really infused the personalities of all of our owners into this one,” John Reed said in the release. Even his parents are moving from Florida to Houston to work at BCK. Overseeing the concept are head chef Jeff Fernandez, general manager Anthony “AJ” Garcia, and bar manager Crisia Araujo, per the release. Fernandez and Garcia moved to Houston from California — where the first Bosscat Kitchen & Libations opened — with the Bosscat team, while native Houstonian Araujo joined in 2017. The menu is inspired by the owners’ childhood favorites and will be populated by guests submissions, too. Some dishes include sweet and sour meatballs, “pasghettio,” pork chops, burgers, Korean-style shrimp, strawberry shortcake and a giant shareable version of Little Debbie cakes. BCK’s bar team — made up of Crisia Araujo, Matt Sharp and Leslie Krockenberger — has crafted cocktails such as Dr. Feelgood, a rye whiskey concoction served in a Dr. Pepper can with crushed ice, and Berry Crunch Milk Punch, which features Buffalo Trace whiskey and Cap’n Crunch Crunch Berries. Fans of Bosscat got their first taste of BCK at pop-up location in December at Lights in the Heights. The BCK space was also available for private events during the second half of December. News that the Bosscat team would take over the Glass Wall location was announced last August. Bosscat Kitchen & Libations, a whiskey bar and eatery, opened its Houston location at 4310 Westheimer Road in February 2017 and currently employs 70 people, a spokesperson confirmed. It was the first Texas location for the joint, which opened its original location in Newport Beach, California, in 2014. Meanwhile, Glass Wall closed last May after nearly 11 years in operation. At the time, owner Studewood Hospitality Group planned to revamp the concept and reopen. The new concept was expected to have a more casual vibe and offer some of Glass Wall’s staple dishes plus healthier options targeting younger diners.